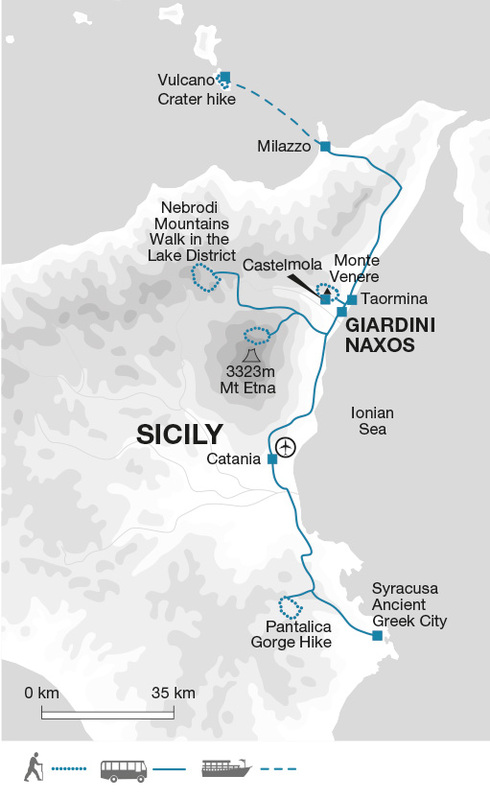 Enjoy a week of walking among the diverse landscapes of eastern Sicily, based in a charming family-run hotel by the beach in Giardini Naxos. Hikes include the lava and pumice strewn landscapes of iconic Mount Etna, Europe's highest volcano and the Nebrodi Mountains National Park, one of Sicily's wildest scenic places. On arrival at Catania Airport we meet our bus and head north along the coast to our base for the week, the seaside town of Giardini Naxos. Once a quiet fishing village, it's now a popular resort, famous for its beaches, panoramic view of the bay and surrounding hills, and a small, but bustling fishing port. Its position is ideal for accessing the endless hiking opportunities and incredibly varied scenery of eastern Sicily. The beautiful hill top town of Taormina, famous for its remarkable ancient theatre, is situated in the hills above Giardini Naxos and can be easily accessed by public bus. Our accommodation for the week, La Riva, is a characterful family-run hotel on the sea front road just a few metres from the beach. The en suite rooms are furnished with Sicilian antiques, there is a cosy bar area and great views of the bay from the restaurant. It's an ideal location is ideal for striking out to explore the excellent and varied walking on offer in eastern Sicily. Our walk today is on the northern slopes of Mount Etna, the highest volcano in Europe (3330m) and one of the largest in the world. Mount Etna is one of the most active volcanoes in the world and is in an almost constant state of activity. We drive up to 1900m on Etna's slopes. Hundreds of subsidiary cones and spent craters have been formed by lateral eruptions along regular lines of fracture which, together with twisted lumps of lava strewn chaotically around, provide an otherworldly setting. Setting out from a height of 1700m, we walk to the fissures of the 2002 eruptions and site of the former ski resort area of Piano Provenzana. We reach a high point on the walk of 2200m. Afterwards we follow the now solidified lava flows downhill through the pine forests to 1900m. Our waiting bus takes us back to our base at the seaside. Today's 10 kilometre walk is expected to take around four hours with a total ascent of 500 metres and a descent of 250 metres. This morning we drive to Milazzo on Sicily's north coast from where we take a ferry to the Aeolian island of Vulcano, named after Zeus' son Vulcan, the God of fire and metalworking. Although now dormant, Vulcano has erupted spectacularly throughout the centuries - the last dramatic explosion being only 100 years ago. In 183BC a huge eruption gave birth to 'Vulcanello' (the Little Volcano) visible from the port. Today, Vulcano puffs out a steady stream of gases and vapour. Even offshore the presence of the sulphur, which was once mined here, is obvious. Our walk to the crater rim provides us with great views of the Aeolian islands scattered around us. Afterwards we can cool off with a swim in the sea. We return to Milazzo by ferry and drive back to Giardini Naxos. Today's seven kilometre walk is expected to take around three hours with a total ascent and descent of 386 metres. Our walk today is a little closer to home. We drive to Castelmola, a medieval village overlooking nearby Taormina and starting point for a 250m ascent up to the summit of Monte Venere. The views from here are simply amazing - from the Strait of Messina and all along the Ionian coastline south to Syracuse, Mount Etna and the Alcantarra Valley. Following old mule tracks through unspoilt typical Mediterranean scrub we follow in the footsteps of Freida Von Richthofen, the wife of author D.H. Lawrence. It's said her amorous adventures with a mule handler here were the inspiration behind the novel Lady Chatterley's Lover. In spring the mountain is abundant with wild orchids. Today's 13 kilometre walk is expected to take around four hours with a total ascent of 385 metres and a descent of 545 metres. Today has been left free to relax on the beach and/or visit Taormina which is just 4 km away and easily accessible by public bus or taxi. Perched on a cliff overlooking the Ionian Sea, this pretty town is home to many historic churches and a number of lively bars and cafes as well as a Graeco-Roman theatre which is famous for one of the most iconic views in Sicily - that of snow-capped Etna acting as a backdrop to the remarkably preserved columned stage. It was a favourite place during the days of the 'Grand Tour' and was frequented by Goethe, Edward Lear, D.H. Lawrence and many others. If enough people are interested it is also possible to organize a trip to the scenic mountain towns of Savoca and Forza D'Agro, where the film The Godfather was shot. We head south today to the area inland from Syracusa where our walk explores the Pantalica Gorge, a deep limestone ravine that has been carved out by the Anapo and Calcinarra rivers. The gorge is also a UNESCO-listed World Heritage Site that is home to over 4000 burial chambers. Peppering the sides of the canyon, the necropolis was built between the 13th and 8th centuries BC. For several centuries before Greek colonization, Pantalica was undoubtedly one of the main sites of eastern Sicily, dominating the surrounding territory. We enjoy an easy hike into and along the bottom of the gorge which is home to a flourishing variety of flora including holm oak, wild sage and thyme, giant fennel and plane trees to enjoy a picnic lunch beside the Anapo River. After our walk we drive on to visit Syracusa on the east coast. During the Greek Classical Period, this city was the largest in the ancient world - even bigger than Athens. Now a UNESCO World Heritage Site, it is also notable as being the birthplace of antiquity's greatest mathematician, Archimedes. We plan to take a stroll on the island of Ortygia where you will have some free time to visit some of the ancient landmarks including the site of the mythological spring of Arethusa and Temple of Apollo. Today's eight kilometre walk is expected to take around three-and-a-half hours with a total ascent and descent of 450 metres. Today we head inland to the one of Sicily's most unspoilt wild areas, the Nebrodi Mountains, a gently undulating range that runs along the north east of Sicily and much of which is a National Park. Our easy walk crosses an upland plateau along trails through meadows grazed by horses and sheep to Lake Trearie (1435m) where we enjoy a picnic lunch with typical Sicilian cheese, salami and maybe even a some wine! Today's nine-and-a-half kilometre walk is expected to take around four hours with a total ascent of 550 metres and a descent of 400 metres. This morning we transfer back to Catania Airport where the trip ends. Savoca and Forza D'Agro - Visit the scenic mountain villages where the film 'The Godfather' was shot €45pp. You will need light layers of clothing for walking during the day and a fleece and waterproof jacket as temperatures can drop on Etna and in the Nebrodi mountains. A sunhat is essential and bring a swimming costume if you wish to bathe in the sea. We recommend you bring walking boots - leather or fabric are both fine. Some of the paths are a bit rocky underfoot and so you could twist an ankle if not wearing boots. Make sure that your boots are worn-in and comfortable before the start of the trip. Trainers are not recommended but you can take trainersandals for relaxing and other sightseeing. We suggest that on international flights you either carry your walking boots in your hand luggage or wear them - should your luggage be lost or delayed, your own boots are the one thing that will be irreplaceable. You should bring a 2 litre water bottle, sunhat, sunglasses and sunscreen. Trekking poles are recommended. La Riva is a characterful family-run hotel that is located just a few metres from the beach in the seaside resort and fishing village of Giardini Naxos. The en suite rooms are furnished with Sicilian antiques, there is a cosy bar area and great views of the bay from the restaurant. It's an ideal location is ideal for striking out to explore the excellent and varied walking on offer in eastern Sicily. Walks on 5 days for between 3 to 4 hours each day. Terrain varies from rocky underfoot to compacted volcanic materials. 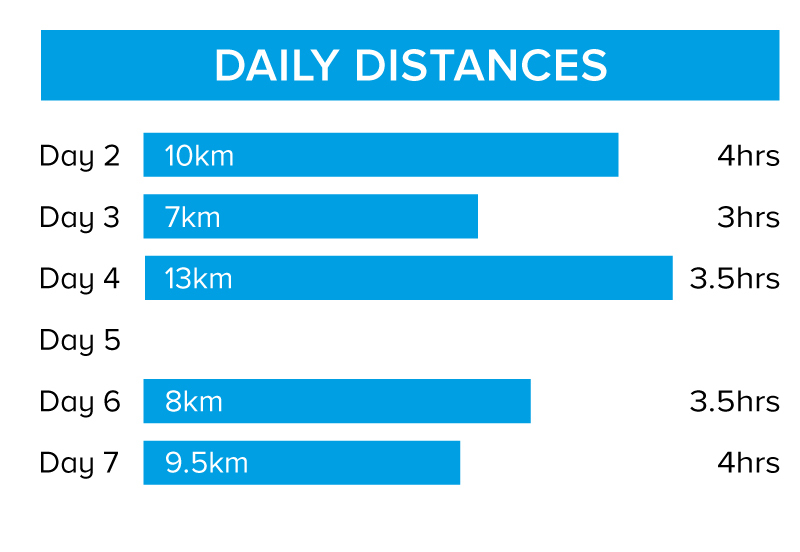 Daily ascents/descents average around 400m.